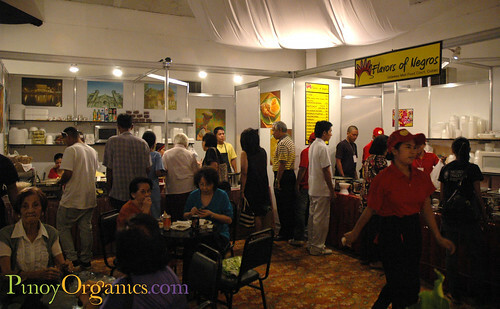 The moment we read about the 25th Negros Trade Fair in a friend’s Facebook wall, we did not miss a minute and headed to Rockwell Tent in Makati City. The event started last Wednesday, September 8th. On the first day, we only had 30 minutes so we decided to just do an ocular, identify which booths to visit again the following day. So, the next day, we made sure that we were there as early as 11am. 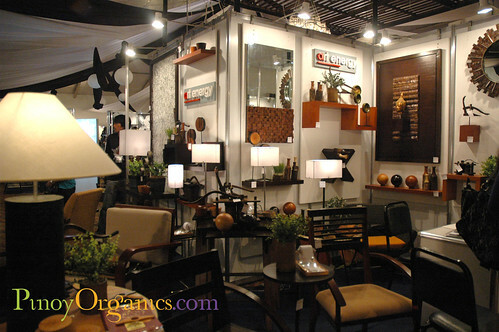 The 25th Negros Trade Fair showcased the latest innovative designs in furniture, lighting, and home furnishings, garments, bags, jewelry, and fashion accessories, testaments to the Negrense’s craftsmanship and ingenuity to transform rustic and indigenous materials to export quality products. 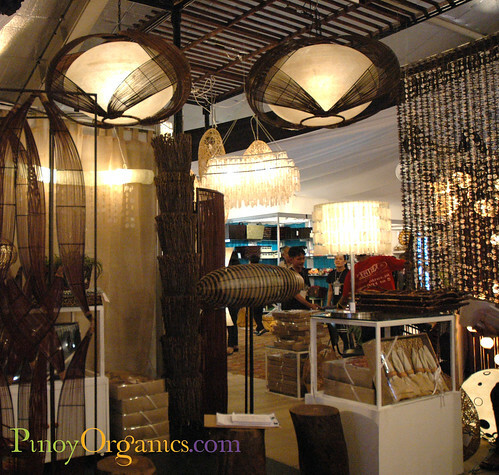 As we entered the tent, we saw Reeds, a furniture company that manufactures home furnishings and accessories made of pandan. Starting with the local market in the Philippines, Reeds has been in the export business since 1987. Expanding its reach globally, Reeds products has graced high-end boutiques and specialty shops in Italy, Spain, France, Belgium, as well as countries in Southeast Asia such as Japan, Singapore and Hongkong. 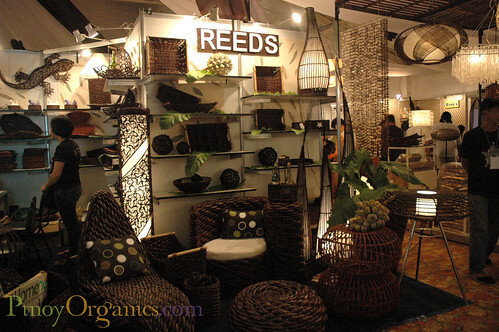 Reeds continues to develop innovative products showcased at the Manila F.A.M.E every April and October in the Philippines, and Cebu X Furniture Fair every February. Glad to see them in Manila this week! Beside it was another furniture, interior & architecture company, Art Energy. We got stuck in this booth for about 30 minutes looking, asking and eventually, buying! 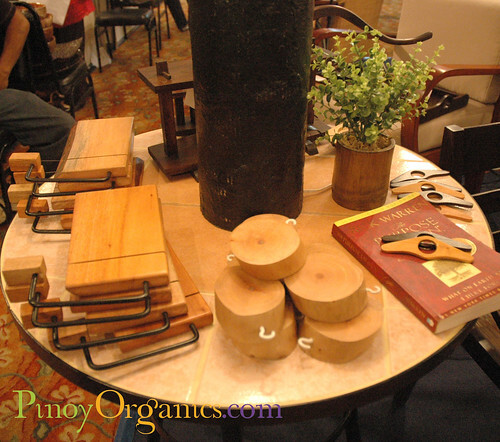 Among their many creative displayed items were (from photo belox, L-R:) the cheese cutting board, mini chopping board and a book marker/spreader made from Mahogany or Gemelina trees. 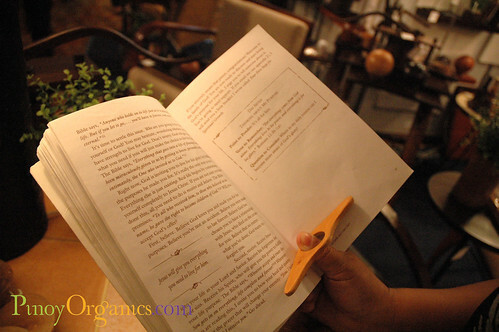 The sales assistant of Art Energy gladly showed me how to use their book spreader. Another feast-for-the-eyes booth was Hacienda Crafts. Within each timeless design and innovative detail lies a reflection of the indigenous Filipino touch. Carefully woven abaca and buri combined with fiberglass and metal produces a stunning and original contrast. Through the warm, rough feel of coco twigs and the smooth, shiny finish of Capiz shells, Hacienda Crafts captures the unique textures and understated beauty that can only come from Nature. Next booth was Atelier Aguila. Since 2005, this company sources materials from sunken logs and boats, driftwoods, agricultural artifacts, and architectural salvages. Artist Karl Aguila creates original, one-of-a-kind, sculptural pieces of furniture that offer distinction from the mass produced – organic instead of synthetic, from the aesthetics to the elemental. Displayed during the trade fair were interesting-looking sculptures made from old rice and corn grinders. The sculptures were on a beautiful buffet table made from recycled old wood. When we spotted this beautiful rose lamp made of dead shells, we just had to stop and stare for about 15 minutes at Tumandok Crafts. Fortunately, Carlos Lanuza, the artist/producer, was there. 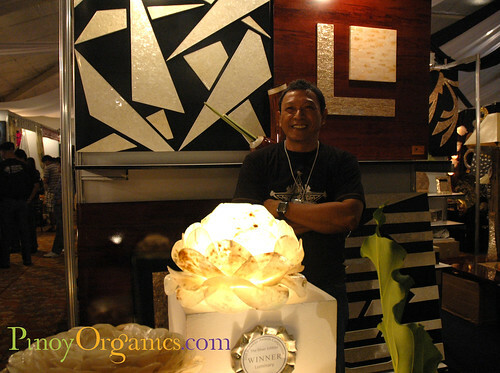 He shared with us how he got inspired to reuse dead shells. The trade fair wouldn’t be complete without food. Traditional Negrense favorites like inasal, fresh ubod lumpia, piaya, mango tarts, napoleones, and puto were also on sale. After lunch, we tried to visit more booths. Alter Trade is one of the pioneers in the Muscovado industry. 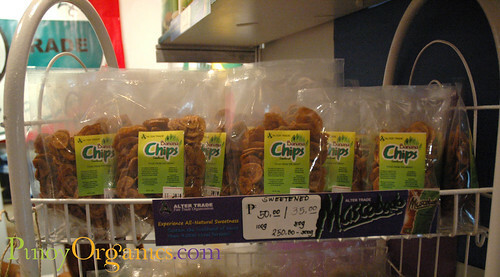 Their muscovado sugar is available in major supermarkets in Metro Manila but their banana chips aren’t. We felt bad when we realized we forgot to buy extra bags for “future consumption”. After lunch, we checked out the next half of the tent. One of our favorites was Ping’s Knitwear by Ping Rodrigo. 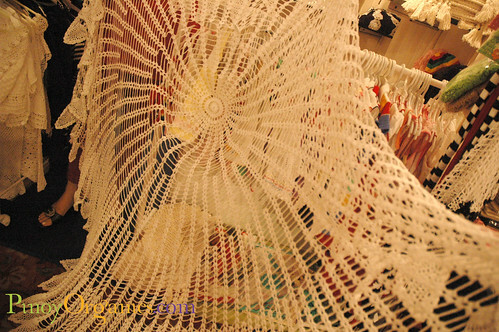 This 6-seater round table handmade crochet table cover is made from 100% cotton. 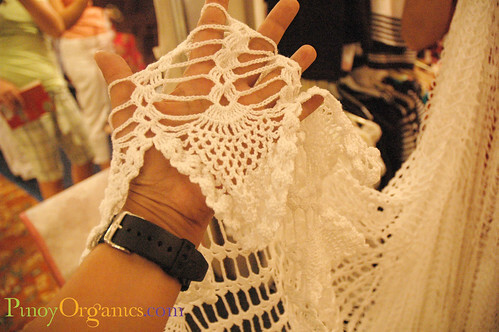 Ping explained to us the process involved to produce this handmade crochet table cover. Next, Nature’s Haven is a Bacolod-based health and wellness company selling naturally sourced products. 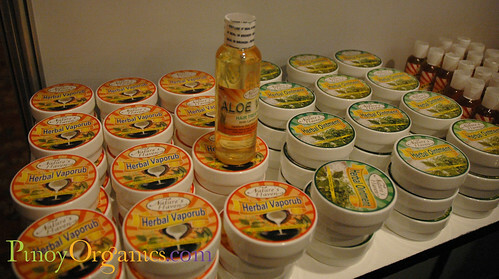 Their bestsellers are organic body oils, vaporub and healing ointment. Fresh Start is another health and wellness company based in Bacolod. We admire their creativity as shown in their products and packaging design. 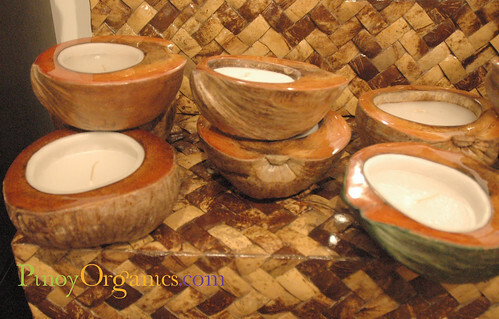 Coco Co. got our vote with these decorative candles inside recycled coco husks! They also sold coco bowls, coco frames and other recycled coco products. One of our final stops was Khrystian Reyes’ Reycon’s. 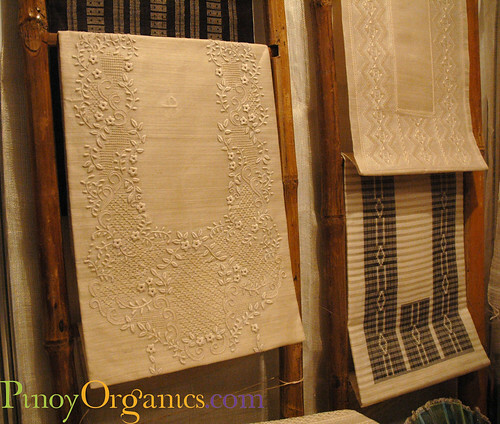 They were selling beautiful Pina barongs, Filipiniana dresses, and abaca slippers. We made sure that we have at least a pair of abaca slippers when we left their booth! After visiting more than two dozen booths, we noticed that Negrenses are focusing on 3Rs when they design or create products: Reduce, Recycle and Reuse. 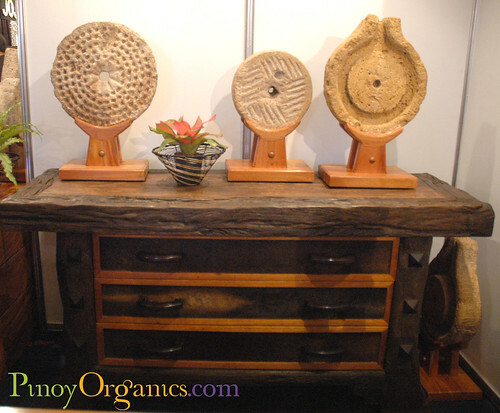 We at Pinoy Organics are proud to see more and more of these products. The 25th Negros Trade Fair will be open daily from 10 a.m. to 9 p.m until Sunday, September 12th. We’re dressing up and going again for the third and last time. Can you guess which of the abaca slippers in the photo luckily made it to our bayong? Thanks for posting the 25th Silver Edition of the Negros Trade Fair… without your generous support and faith in us through the years we would not be where we are today. Maraming salamat! You’re welcome! 😉 We are planning our local travels next year and after seeing your trade fair, Bacolod is definitely in our list!